Earlier this week, Unesco legally endorsed the new label of Unesco Global Geoparks, their first new programme in over 40 years. Many of us have known about Global Geoparks for years, but what are they, and why should we care? A Unesco Global Geopark (as they are now known) is an area with internationally important geological heritage. Here in the UK, there is no shortage of that so what else is needed? Well for a start, they must have a sustainable tourism strategy which in simple terms means that these rocks and landscapes must be used used to attract visitors to the region. In addition, they must also work with and for their local communities, making them the ideal places to disseminate geoscience information. Unesco Global Geoparks provide a perfect platform to engage with the public, in particular in topical issues such as climate change mitigation and geo-hazard awareness. Due to high visitor numbers, quite often Unesco Global Geoparks are the front line of geoscience. They are one of the few places where the general public can easily learn about geology, and understand more about the dynamic planet that we all share. 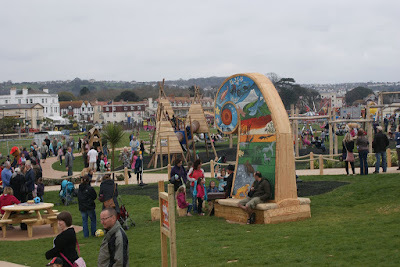 All of the Unesco Global Geoparks in the UK have very successful public science engagement programmes. 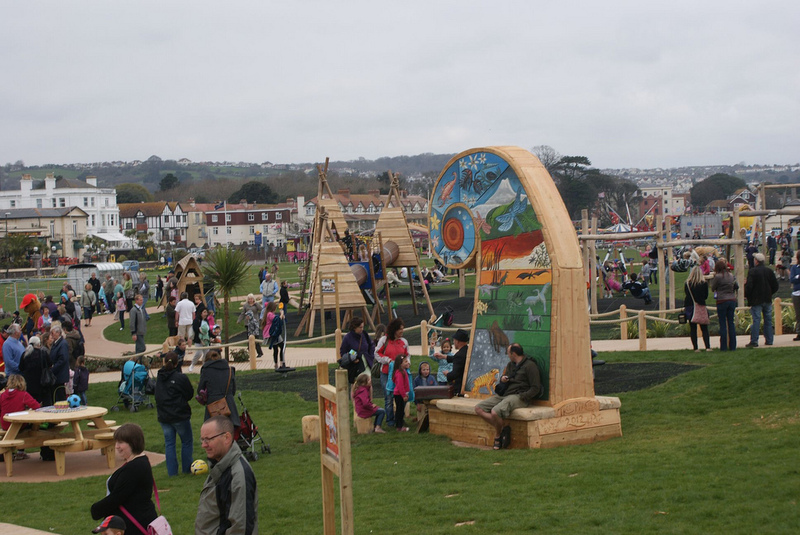 Some of them are very innovative when it comes to geoscience communication such as the Geoplay Park in the English Riviera Unesco Global Geopark that tells the geological story of the Geopark area through a series of themed areas in a carefully designed play park. The North Pennines AONB Unesco Global Geopark have the Rock Detectives children’s geology club, something that has now been rolled out in many other Unesco Global Geoparks. But it’s not all about geology for the public, many of the UK Unesco Global Geoparks have been involved with and still are involved in cutting edge research. Fforest Fawr Unesco Global Geopark, located in the western half of the Brecon Beacons National Park has been used as an outdoor research laboratory for years. Some of the recent research activities have been focused on Traeth Mawr, a peat bog that was a former lake. This important site is being used to apply new and innovative research investigating the effects of climate change and human activities using sediment DNA and pollen stratigraphy. This includes evidence for the introduction of grazing animals at the site and on plant and animal biodiversity from prehistoric times to the present day. Marble Arch Caves Unesco Global Geopark is located in the limestone uplands of Co. Fermanagh in Northern Ireland, and Co. Cavan in the Republic of Ireland. The hydrogeology (or the way that the water flows through the rocks) of Cuilcagh Mountain, the iconic mountain that straddles the border, has been studied for a number of years. A great deal of the research was specifically for the Geopark as it was important to understand the flow of water into the Marble Arch Caves from a public safety perspective. However, the research in this area is by no means complete and an application has just been made for funding to compile a karst database, with particular focus on the area on the Marble Arch Caves Unesco Global Geopark in a bid to fully understand the complex landforms and their distribution in the area. Many of the Unesco Global Geoparks have been mapped and surveyed by the British Geological Survey and are areas of what are known as ‘classic geology’. The Highlands of Scotland have been the focus of research for over 100s of years and now the North West Highlands Unesco Global Geopark is part of that area. Over the last decade, the British Geological Survey has been revising the geological map of the area and has constructed a series of cross-sections that show the geological structure below the surface (click here to download). This extensive range of data is invaluable as it is used for providing information and advice to underpin a range of major infrastructure developments but is also a vital educational tool and helps in the understanding of this complex region. The island of Anglesey is now home to GeoMôn Unesco Global Geopark that has a complex series of landforms and sediments that formed during the last ice age. This distinctive ‘footprint’ is seen as gently rolling landforms and glacial sediments and these have been displayed and interpreted in the interactive Anglesey i-Map. These fantastic landscapes that have been mapped and survey over many decades have now been transformed into a valuable resource for school students, teachers, undergraduates and academic researchers. Communication is an integral part of this research and Geopark Shetland have taken the role of Unesco Global Geoparks as geoscience communicators one step further. 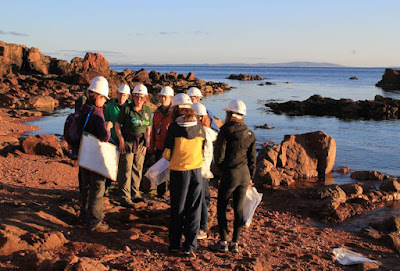 They been involved with organising ‘The Geological Fabric of Scotland’ supported by the University of Aberdeen’s Public Engagement Enabling Fund and the Scottish Government. The aim of this was to share and discuss geological research in Geopark Shetland, allowing geological researchers to communicate their results to the general public at a suitable level, and also to help alleviate the problem of miscommunication of scientific information. The UK's seven Unesco Global Geoparks are a valuable chink in the armour of geoscience communication. They play a significant role in raising awareness of topical issues, and due to the strong infrastructure, expert local knowledge and associations with research institutions many of them have a key role to play in furthering out understanding of these internationally important sites. For more information on the UK Unesco Global Geoparks, then click here.